Actually, I am in Appalachia. But I am off to another part of Appalachia. Ten high school students and four adults including me are spending a week with the Appalachia Service Project in Mingo County, West Virginia. I will be taking a computer break and check back with you upon my return on the 14th! In the meantime, light a candle for our participants (Jim, Richard, Randall, John L., John S., Allison, Merrilee, Samantha, Dillon, Rion, Taylor, Kirby, Heidi, and Isaac) and for all those with whom we will connect. 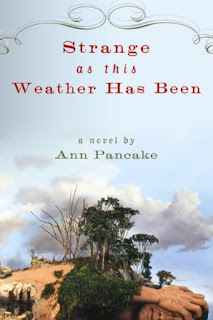 I have been reading an excellent novel, Strange As This Weather Has Been by Ann Pancake. One reviewer called her the Steinbeck of Appalachia. That is no exaggeration. She has created characters with real depth in this precisely paced story about West Virginia mountains and the price that is paid to get at the coal underneath them.